As I try to clarify my own thinking on the issue of integrating the 21st Century Literacies into my classroom, I find myself in the middle between the opposing sides of "stick to the basics" and making "tech geeks" out of my students. When I re-read my reply to Michael I felt like I sounded like a Neo-Luddite who didn't see a place for computers. In actuality, prior to coming to 4th grade almost three years ago, I taught at the middle level for ten years, primarily math, science, and computers. We had a two teacher team which allowed for a great deal of integration of technology and cross-curricular projects. In hindsight, I feel like I sometimes went too far to the extreme of integrating technology possibly to the detriment of the curriculum and the development of thinking skills in my students. So when I came to 4th grade I decided that I would focus on my core curriculum without the technology. As I have moved closer to my personal philosophy of education and have become more comfortable with 4th grade curriculum and workshop philosophy, I have found myself integrating more technology. This time, however, I am making every effort to make sure that the "ends justify the means" and that student thinking and learning are enhanced by the technology they use. What follows are some of the ways that I either am integrating, am planning on integrating, or am brainstorming integrating technology. Moodle. Upper elementary teachers in our district are required to teach half an hour of keyboarding skills to our classes each week (in addition to an hour of computer instruction they receive every other week). Each Friday, my students and I head down to the computer lab where they use All The Right Type for twenty minutes and then we will often login to Moodle for a while to discuss a topic. I used Moodle with my 8th grade students in the past, but had been reluctant to use it with 4th graders. They are learning how to use it quite quickly (although some are more interested in posting 250-point font emoticons of smiling devils than the content they write - thank goodness for the the administrator delete feature). Recent topics have included: "What's the best book you've read this year?" "What's the most important thing you've learned this year?" or the basic "What are your plans over Christmas Break?" "Our Living Minute." This recent article on Choice Literacy has me wondering if adding this structure to our classroom's Morning Meeting routine would allow for opportunities for students to meet some of the standards of the 21st Century Literacies. I'm not sure, but it may be worth a try. Book Review Vodcasts. The reading teacher at my daughter and son's school has recently been creating vodcasts of book reviews by students at the K-2, 3-5, and 6-8 grade levels. I showed them to my students and they were quite interested in the project, but I have been wondering about the management of actually getting the videos recorded and edited. What's the quickest way to do it? Class Wiki. One of our larger 4th grade Science projects involves the study of the animals of the Great Lakes. In the past, students have researched an animal, created a life-like, 3-D model of it, and then written a small book on the attributes of that animal. Lately I have been wondering what it would look like to create a class wiki on the animals of the Great Lakes, incorporating their writing, an image of their model, and possibly some poetry similar to the text insectlopedia. Considering that most of my students are typing around 10 WPM, how long would it take to complete it and how much would I end up doing for them? Probably too much? Would the time spent be worth the learning that results? So, those are a few of my ideas. Your thoughts? Thank you for sharing your thoughts on this interesting question. When I read your post at English Companion, far from thinking you a Luddite, I could see that you were trying to make best use of your time and resources for your students' sakes. The great thing about much of the new technology, I believe, is that it is intrinsically motivating to kids. My vision would be of students embracing digital learning , so long as they have the cognitive skills necessary. However, visions are just that - reality is about questions like "how much money? ", "when are they ready? ", "how much time", "what are our priorities?" etc. I'll follow your progress with interest. I feel like this is exactly the kind of conversation we need. Great examples of technology as a tool in the elementary classroom. I worry when people try to use technology for the sake of technology but I am not sure I know what is possible yet. These ideas all have some bigger learning with the technology as the tool. Thoughtful examples like this at the elementary level are hard to find. Thanks for sharing. I'm curious as to how your students have responded to using moodle. Do they enjoy it? I've used moodle at both the high school and college levels and found its purpose to be very different in the two settings. Do you use it mainly for discussion, or do you post organizational and classroom information on it as well? My students have enjoyed using Moodle. As we are not 1:1 yet (1 computer per student), we use Moodle sporadically. 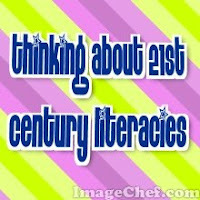 I use it mostly for discussion (they have enjoyed using it to discuss book club books before meeting face to face). How do my beliefs and practices line up?